Immigration attorneys will tell you that just about everyone who comes into the United States legally wants to work and contribute to society. That's especially true for those who participate in the EB 5 investor visa program. Individuals who are granted a visa under this program are actually required to invest money into a business here and subsequently create jobs for other qualified residents. This is excellent news for the American workforce and the economy at-large. The financial investment required by entrepreneurs who want to obtain an EB-5 visa must go towards the foundation of a business. This business must provide employment opportunities for at least 10 full-time U.S. workers. The creation or preservation of these positions must be created within the two-year residency period granted to the investor by this visa program (or before the investor files their I-526). These jobs may be defined as direct, indirect, or induced positions. The type of investment made by the entrepreneur determines which kinds of jobs can be created. These jobs may either exist directly in the company; be in businesses affiliated with an EB-5 regional center (a private or public entity that is designated to improve the economy of a specific region); or be created within the community affected. All of the jobs created must be full-time positions, meaning that the employee works for a minimum of 35 hours per week and cannot be an independent contractor. These workers may be U.S. citizens, permanent residents, refugees, or those seeking asylum; they cannot be other EB-5 investors, relatives of the entrepreneur, temporary visa holders, or nonimmigrants. Since 1992, EB-5 Regional Centers have been designated under the law as economic units or entities that can offer both direct and indirect jobs that count towards the investor's required 10 created or maintained positions. Regional centers, as briefly explained above, can be either public or private entities that have been deemed to increase economic growth, job creation, capital investment, and overall productivity within a certain area. The United States Citizenship and Immigration Services is in charge of designating these regional centers, and the agency uses specific criteria to do so. EB 5 visa lawyers may suggest that entrepreneurs invest through these regional centers, rather than in one specific business, so that the job creation requirement is easier to meet. That's because investing through a regional center will allow direct, indirect, and induced jobs to be counted towards that requirement. Going this route may provide a greater number of opportunities for employment and an easier time of satisfying the conditions of the visa program. Your immigration attorney may also inform you that premium processing might be available when investing in this manner. Regardless of how you choose to invest, the EB-5 visa program is extremely good news for the American workforce. 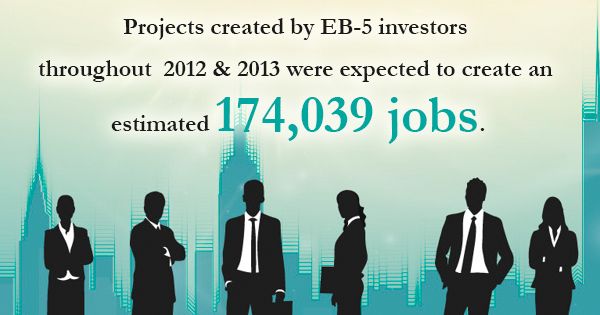 According to the U.S. Department of Commerce, projects created by EB-5 investors throughout 2012 and 2013 were expected to create an estimated 174,039 jobs. Not only do these investors contribute their own capital as part of the program requirements, but their ability to create these jobs also adds a lot to the regional and national economy. When residents are able to secure gainful employment, particularly in the areas that need job creation the most, they'll contribute more to it on a local level. If you are interested in coming to the United States through the EB-5 investor visa program, you deserve to work with the best immigration attorney for your needs. For more information on this visa program or to learn how we can help, contact us today.